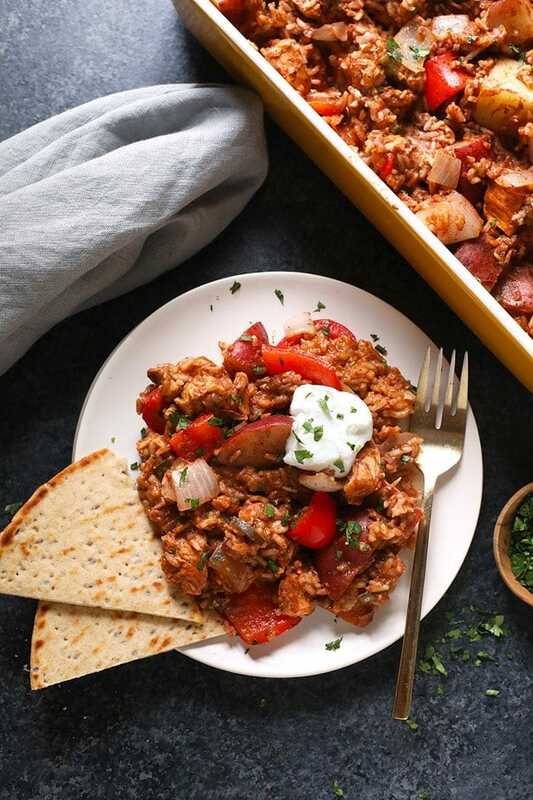 This chicken tikka masala casserole recipe is one of the most delicious and easy chicken casserole recipes around! 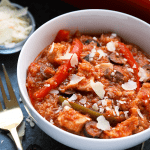 It has all of the traditional flavors of chicken tikka masala in casserole form. 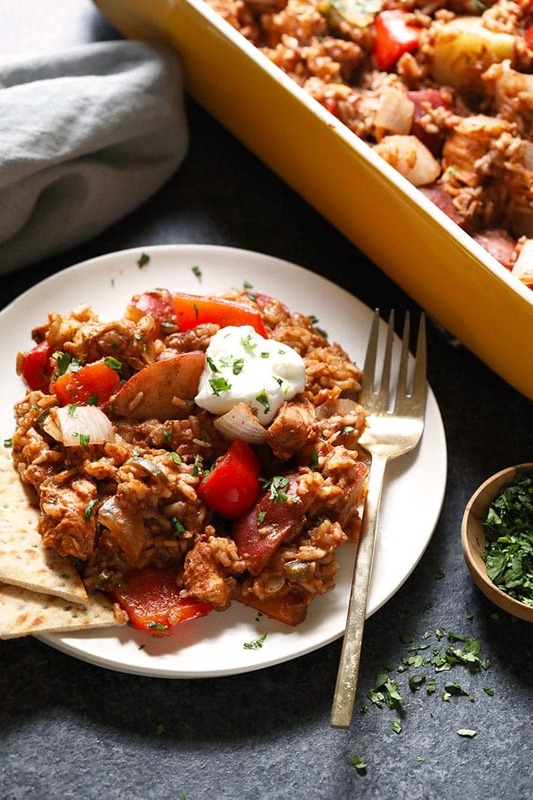 Make this chicken tikka masala casserole for dinner this week! Chicken Tikka Masala, Chicken Tikka Masala, Chicken TIKKA MASALA. WAWHOO! You guys have been asking for a Chicken Tikka Masala recipe ever since we came out with our Meal Prep Cauliflower Tikka Masala. We totally understand why! We love tikka masala recipes because they are jam-packed with flavor. Our goal with tikka masala recipes is to make tikka accessible to you! If you’re a tikka masala master, teach us your ways! If you are looking for easy tikka masala recipes that are approachable, delicious, and easy you’ve come to the right place! 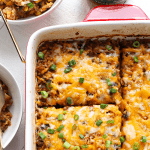 When testing this recipe, we knew that we wanted to do it CASSEROLE style. Why? Because what’s easier than throwing all of your favorite ingredients into a casserole dish and then it’s ready in an hour? Nothing! We had a lot of fun developing this recipe and wanted to bring you along, step-by-step, in the process! Check it out below. 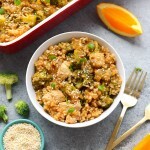 I wanted to the chicken in this recipe to be tender and flavorful. Marinating chicken in any dairy will help tenderize the chicken. Give it a try! 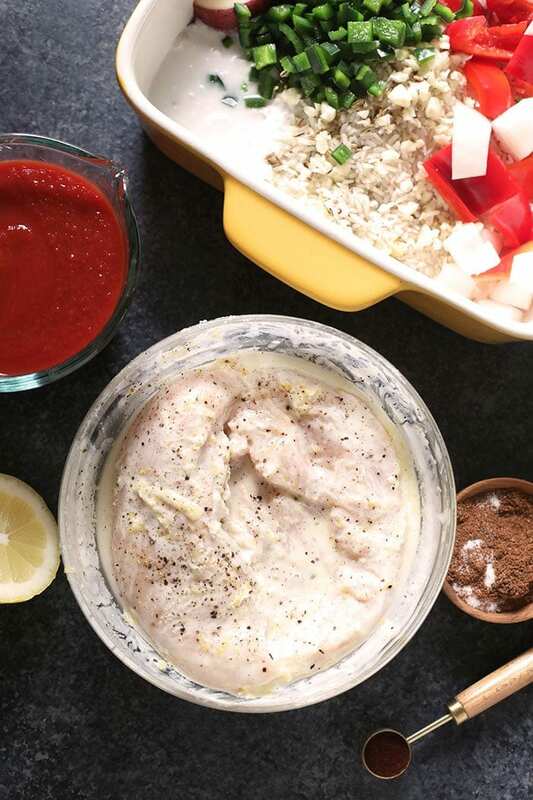 If you are dairy-free go ahead and skip the yogurt marinade. As for the veggies in this dish. 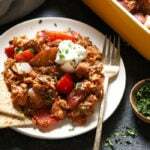 Typically a chicken tikka masala is made with chicken tomatoes, spices, and cream. We wanted to make this a full meal by adding veggies! We went with red peppers, tomatoes, onions, and a spicy pepper. 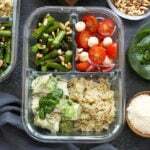 Feel free to change up the vegetables based on your favorites or what you have in your fridge. The spiciness of this dish depends on what pepper you decide to dice up in this dish. We tested it once with a serrano and once with a spicy green chili. Go with your gut and go with whatever spice level you’re most comfortable with. Lastly, the spices are the hero of this dish. A Garam Masala is a classic spice mix when you’re making tikka masala. We used that and after some research, we decided to give fenugreek a try! It really elevates the flavor of this dish. Fenugreek has a nutty and sweet flavor that is in some traditional tikka recipes. It can be hard to find, so do a little research before you grocery shop (we found ours at Fresh Thyme’s spice section). If you are unable to find fenugreek, you can try celery seeds or fennel seeds as a substitute. We tested this recipe with fennel seeds and it came out a lot sweeter than the fenugreek. It was good, but just keep that in mind! Lastly, mixing all the spices and liquids together before putting them in the casserole helps to combine all the ingredients of the sauce pre-baking. So don’t skip that part! Just like many Fit Foodie Finds casseroles, we covered this casserole with tin foil. It keeps the bake time low! 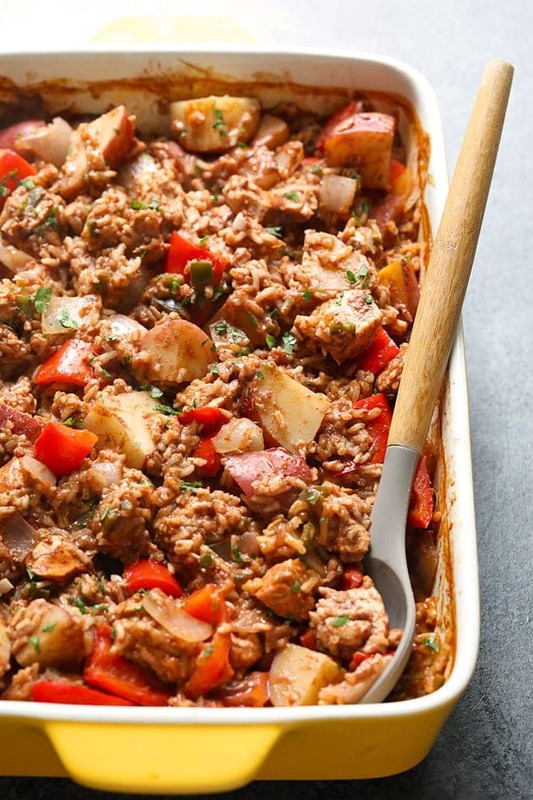 Place your covered casserole into the oven and bake for one hour, stirring halfway! It will seem a bit soupy, but remember, there are still 30 minutes left to go. Remove your casserole from the oven and let stand for 5 minutes. Remove the tin foil and give your casserole a stir. Serve with Greek yogurt, parsley, and naan bread! Preheat the oven to 375ºF and spray a casserole dish with cooking spray. Set aside. Next, cut the chicken into 1-inch squares and place it in a medium bowl. Add ingredients for the marinade to the bowl and mix well. Let chicken sit in the marinade for ten minutes. Heat a large skillet pan over medium/high heat. Place serrano pepper in the pan and heat for 2-3 minutes on each side or until pepper is charred. In the last minute of cooking the pepper, add fenugreek to the skillet, toasting the seeds until fragrant. Remove from heat and when the pepper is cool, chop and add pepper and fenugreek to casserole dish. Then, add tomato sauce, broth, coconut milk, ginger, chili powder, garam masala, and salt into a large mixing bowl. Whisk together until well combined. Set aside. Finally, add potatoes, red pepper, onion, garlic, jasmine rice, and marinated chicken to the casserole dish. Pour the sauce mixture over the vegetables and chicken. Mix well and cover with aluminum foil. 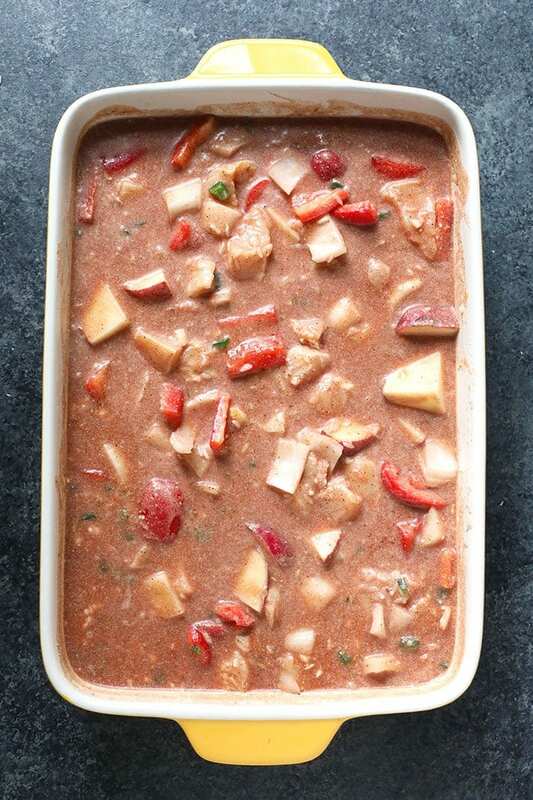 Place in the oven and bake for 1 hour at 375ºF, stirring at 30 minutes and placing back into the oven. Feel free to substitute with your favorite pepper. If you don’t have fenugreek, substitute fennel.